As September rolls on, we're noticing a distinct change in the seasons. Despite a late Summer heatwave hitting lots of the UK, the leaves are starting to fall, pinecones are scattered around and the days are getting shorter. Take inspiration from these changes in the nature around us and embrace that the evenings drawing in. Add touches of autumnal warmth to any party or event you are planning this month. 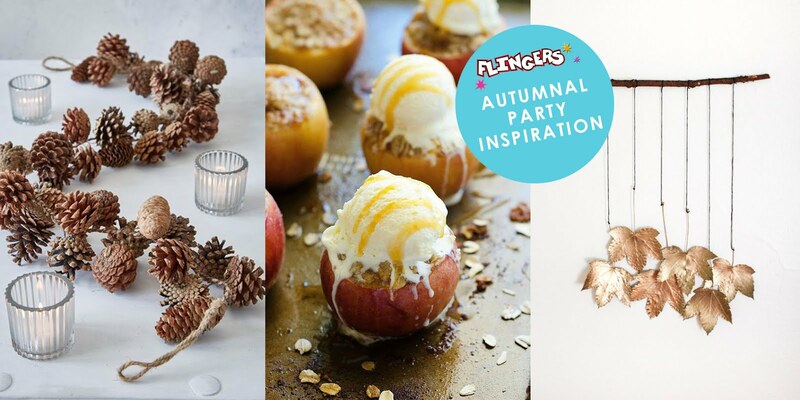 We've been picking out some awesome autumn themedparty ideas and decoration inspiration to make your party plans that little more seasonal. From chic DIY ideas to create beautiful garlands using the materials that nature provides us at this time of year. To delicious recipes to keep you warm as the evenings take hold, (we remember why we like this time of year so much now!). Keep to a rich colour scheme that suits the season, think warming oranges, reds, golds and soft greens for your balloons, streamers, tableware and everything in between! Come join us on Pinterest and start pinning rich autumnal inspiration and party ideas to brighten up any event you have coming up in the coming weeks.